Introduction. Two Traditions. Lambda Calculus and Theory of Types. Categorial Grammar. A Logical Perspective. The Hierarchy of Implicational Logics. Proofs, Terms, and Meanings. Proof Theory. Exploring Categorial Deduction. Cut Elimination and Decidability. Recognizing Power. Model Theory. Enumerating Readings. Computing Denotational Constraints. Boolean Structure. Variations and Extensions. Intensionality. Variable Polymorphism and Higher Type Theories. Towards a Logic of Information. Language Families. Modal Logic of Information Patterns. Relational Algebra of Control. Dynamic Logic. A Tour of Basic Logic. Bibliography. Index. This monograph began life as a series of papers documenting five years of research into the logical foundations of Categorial Grammar, a grammatical paradigm which has close analogies with Lambda Calculus and Type Theory. The technical theory presented here stems from the interface between Logic and Linguistics and, in particular, the theory of generalized quantification. 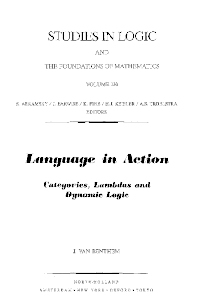 A categorical framework with lambda calculus-oriented semantics is a convenient vehicle for generalizing semantic insights (obtained in various corners of natural language) into one coherent theory. The book aims to demonstrate to fellow logicians that the resulting applied lambda calculus has intrinsic logical interest. In the final analysis, the idea is not just to `break the syntactic code' of natural languages but to understand the cognitive functioning of the human mind. Johan van Benthem is Professor of Logic at the University of Amsterdam (Department of Mathematics and Computer Science) as well as at Stanford University (Bonsall visiting chair, Department of Philosophy). His research interests include modal and dynamic logic, type-theoretic semantics, and proof-theoretic grammars.